Rowing is a favorite among those health-conscious people who love to do cardio with some strength training as well. However, you’ll often see people using treadmills or spin bikes for cardio. Why? The answer actually is pretty simple. On a treadmill, all you have to do is walk forward and on a bike, all you have to do is paddle forward. In a rowing machine, however, you’ll need to sit down, maintain a posture, and use your back and shoulder muscles to create resistance to move backward. It might be a little confusing and take some time to get used to, which is why rowing machines may not be your favorite workout machine initially. But over time you’ll begin to love it. That is as long as you avoid a few mistakes and row properly. 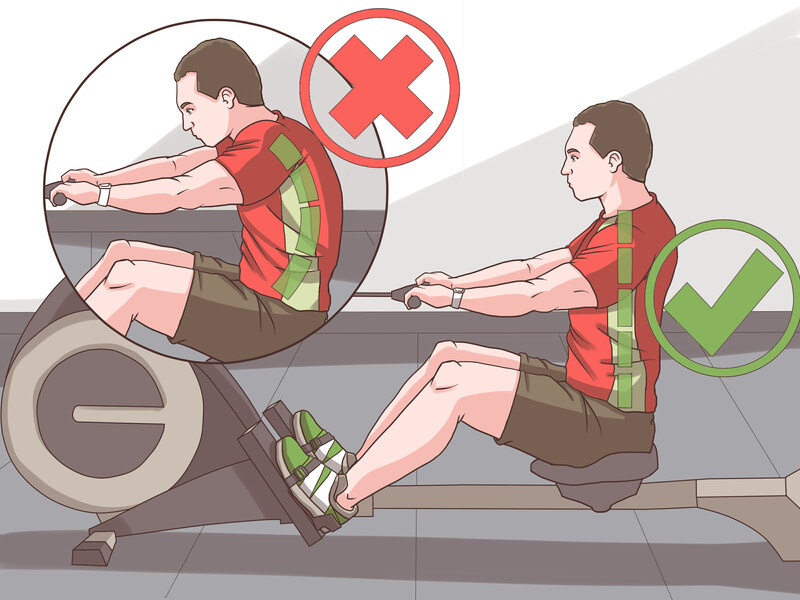 If you don’t use the correct form and follow the proper rowing machine technique, you’ll end up hurting your back and shoulders and targeting the wrong muscle groups. It’s a risky business that you’re getting into, so being prepared is your best bet. This is where we step in. These are the most common mistakes rowers make and with the right procedures, you can avoid them quite easily. Balance is everything on a rowing machine. Most people strap their feet to the machine because while rowing, it’s quite difficult to keep your feet on the footholds – they’ll tend to slip away. However, most experts would suggest that rowing should be done without strapping the feet. Maintaining the balance of the feet while rowing is a skill in itself. Also, when you’ll bend forward, don’t make the move immediately and also don’t start using your body and arms so soon. Start it slow and you can increase your pace gradually. Focus on working your way from the bigger to the smaller muscle groups. The seat of a rowing machine is adjustable and moves back and forth, allowing your legs to extend. People often make the mistake of not synchronizing the motion of the handle with the seat. However, that’s one of the most important things to remember. If you don’t do this, you’ll end up feeling uncomfortable when using your rowing machine and your power and momentum would be lost. So, when you are seated, first grab the handle while your knees are bent and the core is tight enough. Sit straight and move forward and then push yourself back. This way, it would be easier to maintain the speed of your seat and handle at the same rate, in a synchronized manner. When rowing, users often lean too much, so their backs don’t stay straight anymore. However, keeping your body at right angles should be your target. Leaning too forward stresses on the back unnecessarily, and it’s not like leaning would help your rowing power to increase. There is also a high chance of injury at the back with prolonged leaning. This is why keep yourself at 90 degrees and row making sure that your feet are not apart and not strapped to the footholds. Are you not sitting on the rowing machine like you should? If not, then you better check your form. A lot of rowers row while keeping their hips inclined towards the front. It appears as if one is rowing behind the hips. This actually shouldn’t be the case. The torso should be exactly on top of the hips with the back being straight. When rowing, only the torso portion can be worked up. While the arms and legs are straight and extended, move back and forth using only your hips. Having the correct form of grip is important. Some people tend to hold the handle only with their knuckles while others hold with the underside of the hands facing upwards. But that’s an incorrect grip. The correct way to hold the handles is to ensure that your entire hands wrap around the handle, with the thumbs under the handle. This way, with rowing you can strengthen your grip. Your wrists should remain flat and don’t bend them too much. If you’re having difficulty rowing, then these might be the problems that are stopping you from rowing properly. Try and fix these issues, and soon you’ll get addicted to rowing! Rowing is not just any action. It’s not as simple as running or paddling. It actually has a number of sequential steps, which you need to follow the right way to lose weight. With the right posture and maintaining the form correctly, you’ll get the hang of rowing easily. You won’t make the mistake of rowing in weird ways and end up hurting yourself, plus you’ll get to use the right muscle groups for strength and cardio exercises. Catch: The first step is called the catch. As the name suggests, it’s basically gripping the handle. First sit on the seat comfortably, with your knees bent and your feet on the foothold. Make sure your back is upright and at right angles to the floor as mentioned before. Extend your arms as much as possible and grab the handle with the proper grip and then lean your upper body in a way that your shoulders are in front of the hips (and not the other way around). Drive: It’s time to get going, but remember that you have to maintain the catch form throughout the whole exercise session. To initiate the drive, straighten your back, tighten your core, maintain a strong grip and push your legs back from the bending position until they’re straight. Lean your torso a bit backwards and then pull the handle with your arms bending at your elbows. Finish: Keep your legs straight, elbows bent and pull the handle towards the lower chest, Your arms should not touch your rib cage but remember not to push them out too far away. The core should be strong and the back still straightened. Recovery: This is the complete opposite of the drive form. Let your arms straighten up to the full extent and then hinge your torso forward. Your back should still be straightened and core tightened, and your knees slowly bending once the handle goes back to its original position. These rowing forms should be maintained in appropriate timings and repeated throughout the entire exercise. This way you’ll master rowing techniques in no time. 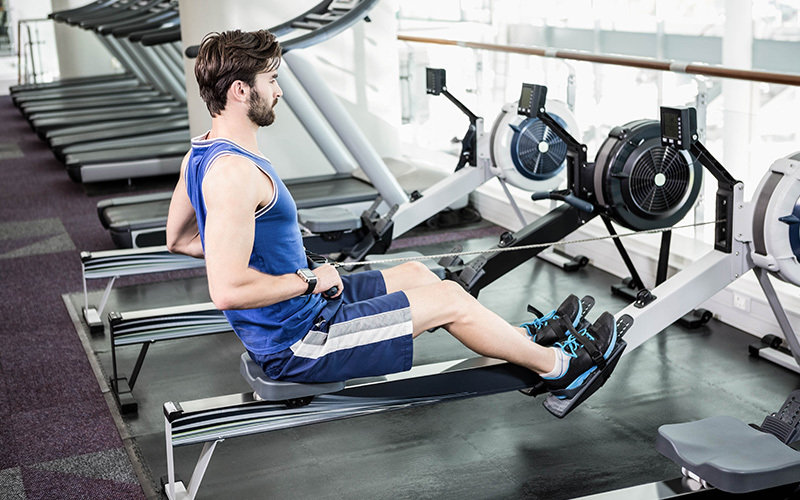 The proper rowing technique will take some time to get used to, but with more muscle power and muscle memory, your endurance and stamina will increase and you’ll master these forms as if they’re no big deal. You’ll also get a toned physique and the body shape you’ve been dreaming of. With time and effort, you can surely become a good rower whatever workout regimen you follow. Don’t overanalyze everything, otherwise, you’ll make it harder for yourself than you already made it out to be. The forms should all be done in one smooth movement, so no pauses! If you’re serious about losing weight and getting a toned body, just using the proper rowing technique alone is not sufficient. Rowing might get you a better-looking body, but health is totally on you. A healthy amount of sleep and proper consumption of calories and water will ensure that you’re feeling great in the inside as well as outside. So get a top-notch rowing machine today, make the most of it, and soon, you’ll feel the change yourself! Next articleTropical Pool Design Ideas: How to Give a Tropical Feel to Your Pool?